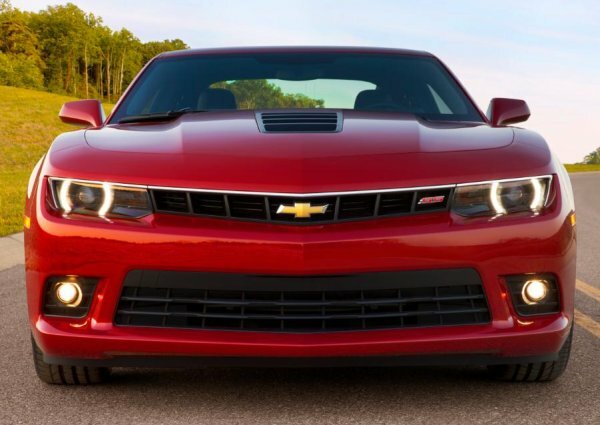 The Chevrolet Camaro outsold the Ford Mustang and the Dodge Challenger in September 2013 for the third straight month and the seventh time in 2013 – allowing the Camaro to continue building a lead as General Motors eyes their fourth straight muscle car sales title. In September 2013, General Motors sold 5,659 copies of the Chevrolet Camaro convertible and coupe with a mix of the “old” 2013 models and the refreshed 2014model year that have just recently begun showing up at dealerships around the country. Even though that number represents a decline in sales from last September (of just 0.2%), the number of Camaros sold last month was more than enough for the Chevy muscle car to comfortably outsell the Ford Mustang and the Dodge Challenger. On the year, the Camaro has reported a sales decline of 6% in moving 64,815 units through the first nine months. Ford Motor Company sold 4,420 copies of the mighty Mustang in September 2013 for a year over year drop of 0.4%. Thanks to a variety of very strong months in May, June and July, the Ford Mustang looked like it might be able to prevent the Chevrolet Camaro from claiming its fourth straight annual segment sales title but with back to back to back months where the Camaro comfortably outsold the Mustang, it is going to be very tough for the Mustang to come from behind before 2013 ends. Right now, Ford has sold 59,165 Mustangs through the first three quarters of the year – 11.5% down from the same period one year earlier. It should be noted that the Ford Mustang claimed the monthly sales titles in October and November after having a very slow September in 2012. The problem is that with the Mustang trailing the Camaro right now by 5,650 units, the Camaro would have to post very poor numbers in October, November and December while the Mustang would need to post substantially better numbers this year than it did in the fourth quarter of 2012. The Mustang might post better numbers over the next three months but with Chevy fans snatching up 2014 Camaro coupes and convertibles, it is going to be a very, very hard fight for Ford to end 2013. Ford could very well define the odds but right now; the odds say that Chevrolet is close to claiming its fourth straight muscle car sales title. The Dodge Challenger is rarely in any sort of position to compete with either the Camaro or Mustang in monthly or annual sales and with 3,932 units sold last month, September was no exception. The good news for Chrysler is that those 3,932 units sold represent an increase of 22% from the same month in 2012 and with 42,577 units sold so far this year, the Challenger is 27% ahead of its pace from 2012. This is especially impressive considering that the Challenger really hasn’t seen any changes over the past few years while the Mustang and Camaro have both received significant facelifts in the past few years. Like the Mustang, the Challenger is expected to debut a new generation in 2014 – at which point the Challenger might be able to more closely compete with the cross town rivals in the muscle car segment.